Scientific marvels are all around us – from our bodies to the uncovered wonders of outer space. On Saturday, April 21, from 12 to 4 p.m., satisfy your curiosity and experience science in new ways at Science Everywhere, one of the most entertaining festivals in Greensboro. The event is part of the North Carolina Science Festival and is free and open to the public. Participants will have the opportunity to embrace their inner scientist with nearly 80 hands-on activities across the UNCG campus. Food science, astronomy, computer science, chemistry and technology are just a few of the topics to explore. Begin your science adventure at one of four welcome centers, located in front of the School of Education Building, Sullivan Science Building, Coleman Building and Foust Park, where you will check-in and receive an activity passport. Explore UNCG’s campus and observe, discover and create along the way. Participants can use the free shuttle service to move easily from one part of campus to the next, as activities span from Peabody Park all the way to the School of Education Building. The first 1,000 children to arrive will receive a free T-shirt and the first 1,000 families will receive a complimentary tote bag. For more information, visit scienceeverywhere.wp.uncg.edu. Several UNCG Enrollment Management offices haved moved from McIver Building to Forney, bringing with the move a new name and increased student traffic. Renamed Forney Student Success Commons to reflect the abundance of student success services provided, the refurbished spaces will host upwards of 750 student appointments per week, and, when finished, will sport shades of blue and gold with super-graphics depicting student success and Spartan spirit. An open house will be planned once the final touches are done. Tutoring and Academic Skills Programs(TASP) – TASP challenges students to become independent and successful learners through peer tutoring, guidance on study skills, and workshop offerings on learning strategies and the application academic skills. Retention Initiatives – focused on first year retention through the coordination of a University-wide retention council, the Frontier Set grant, which includes the summer bridge program, Spartan Start Up, for select new students, and implementing academic advisor training programs. College Completion Initiatives – focusing on grants and special projects supporting student success, including the Spartan Male Initiative and the UNCG CHANCE Latino/Hispanic High School Summer Initiative. See related story, about other departments that had been in McIver Building. Through Feb. 18. Triad Stage, with several UNCG students, alumni and faculty members on the cast and creative team, produces “Raisin in the Sun.” See details in related post. Thurs, Feb 8: Colson Whitehead, author of “The Underground Railroad.” UC/LS talk. School of Music Recital Hall, 8 p.m. Sold out, but simulcast will be available for those who register while space in nearby hall remains. #BlackFountain: The Summit day conference. EUC, 10 a.m. to 3 p.m.
#BlackFountain: The Summit evening show, UNCG Auditorium, 5 p.m. #BlackFountain includes musical and dramatic performances, spoken word, fine art, fashion and more. Mon, Feb 12: MLK Celebration: Payton Head. Harrison Auditorium (NC A&T), 7 p.m. See details here. Wed, Feb 14: Conversation With the Community: Dr. Duane Cyrus (Dance). EUC, Alexander Room, 7 p.m. Duane Cyrus will be hosting a workshop on representation and perspectives of black men. Fri, Feb 16: Community Dialogue: “Black and Biracial,” EUC 062, 1:30 p.m. A panel and dialogue exploring the experiences and perceptions of individuals who identify as biracial. 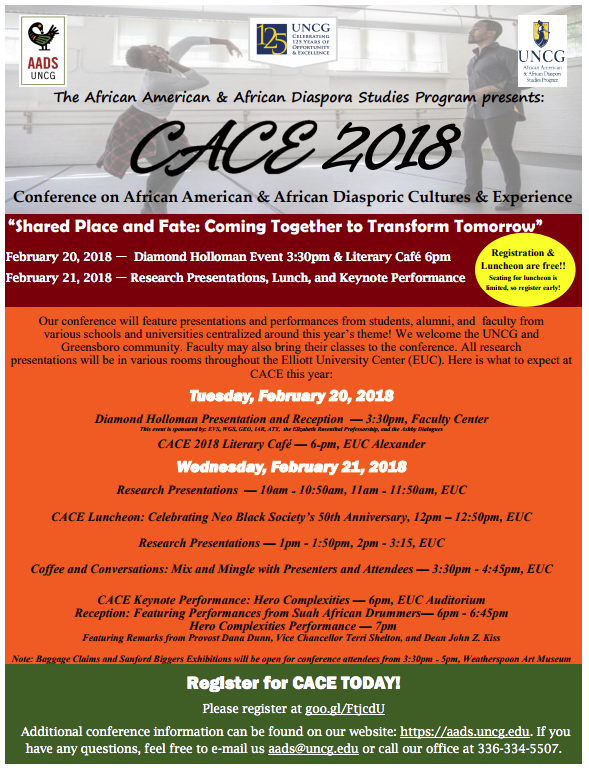 Tues, Feb 20: CACE 2018: Conference Speaker, Diamond Holloman. UNCG Faculty Center, 3:30 p.m. Diamond Holloman will be hosting a discussion on urban community gardens and social justice. Reception to follow. Literary Cafe. EUC Alexander, 6 p.m. Come listen to spoken word performances about negotiating and challenging divisive discourse and coming together to solve issues impacting people of African descent and other communities. Facilitated by Demetrius Noble. Wed, Feb 21: CACE 2018 continues: Conference on African American & African Diasporic Culture Experience. EUC (multiple rooms), all day. Sponsored by The African American and African Diaspora Studies Program. This year’s theme is: Shared Place and Fate: Coming Together to Transform. Wed, Feb 21: Noon-Time Talk: Documenting Slavery and Freedom with Gwen Gosney Erickson, Guilford College Archivist and Librarian, and Richard Cox, UNCG Digital Technology Consultant. Weatherspoon Art Museum, noon. They will share their experiences preserving and making publicly accessible primary source materials like letters, newspaper articles, and deeds that document anti-slavery and slavery activities in Greensboro and in North Carolina. Thurs, Feb 22: Reel Talk: Dine and Dialogue Film Series. Spartan Village 2: Haywood Clubhouse, 5:30 p.m.
Mon, Feb 26: Tunnel of Oppression, EUC Cone Ballroom, 1 p.m. to 7:30 p.m. Hosted by the UNCG Office of Intercultural Engagement and UNCG Kaleidoscope. It’s an educational, interactive event portraying an example of how oppression may be experienced. Wed, Feb 28: Lyrical Sanctuary Open Mic Night. 7 p.m., EUC Auditorium. Thursday, March 1 – Book discussion of Colson Whitehead’s “The Underground Railroad,” Weatherspoon Art Museum. A pre-talk reception begins at 6:30 p.m. and the book discussion begins at 7 p.m. The first 10 attendees will receive a complimentary copy of “The Underground Railroad.” The event is free and open to the public. Dr. Noelle Morrissette, UNCG associate professor of English, will lead the book discussion, which is in conjunction with the exhibition of work by Sanford Biggers. March 15-16 Campus-wide Symposium UNCG will host a symposium featuring keynote speakers, poets, and performers. “Celebrating God’s Trombones: African American Cadences and Culture” acknowledges the ninetieth anniversary publication of James Weldon Johnson’s beloved work. All events are free and open to the public. This event will feature an exhibition in Jackson Library’s Hodges Reading Room, as well as a performance in the Music Building by the trombone shout band Kenny and the Tigers, along with scholarly presentations and poetry readings. See details in a future Campus Weekly. An exhibition opens this Friday evening (Oct. 20) at the Greensboro Project Space on Lewis Street. The space is the UNCG School of Art’s contemporary art center. “Intrusions of Grace: A Visual Response to the Works of Flannery O’Connor” is the combined photographic works of Southern artists Anne Berry (Newnan, Georgia) and Lori Vrba (Chapel Hill, North Carolina). Curated by Dennis Kiel, Director of the Dishman Art Museum of Lamar University, Beaumont, Texas. The works in this exhibit also hint at the mystery of the unknown and the existence of things beyond the surface. These works, like O’Connor’s stories, present something real and believable while hinting at what is invisible but nonetheless true. Also, a “Southern Artist Panel” will be held on Oct. 27, 6:30 – 7:30 p.m. Learn more about GPS events at http://www.greensboroprojectspace.com/. The Women and Gender Studies Program of the College of Arts and Sciences presents the first lecture in The Dylan Rose Kadis and Eloise Hall Kadis Lecture Series. “The Institutional as Usual: Sexism, Racism, and the Politics of Complaint” will be presented by Dr. Sara Ahmed Oct. 18, 4 -5 p.m., in the Maple Room, Elliott University Center. How do everyday forms of talk help shape how institutions of various kinds (such as government agencies, universities, and businesses) work? In this talk, Dr. Sara Ahmed offers a feminist analysis of how ordinary conversation, including joking and banter, helps perpetuate and normalize institutionalized forms of sexism and racism. She further addresses what happens when people seek to complain about such ordinary conversation. What does the institutional response to such complaints tell us about how contemporary forms of power work and how oppression gets reproduced through repeated, seemingly small actions? Sara Ahmed is an independent scholar and feminist writer. She has held academic posts at Lancaster University and Goldsmiths, University of London. Her books include Living a Feminist Life (2017), Willful Subjects (2014), On Being Included (2012), The Promise of Happiness (2010), Queer Phenomenology (2006), The Cultural Politics of Emotion (2014, 2004), Strange Encounters (2000) and Differences that Matter (1998). The Dylan Rose Kadis and Eloise Hall Kadis Lecture Series is made possible by a generous donation from Claudia Buchdal Kadis ’65 to honor her granddaughters Dylan Rose and Eloise Hall and her husband, Bobby Kadis. The lecture will be followed by heavy hors d’oeuvres. There is no fee to attend, but please rsvp to Julie Potter at jdpotte2@uncg.edu. The 8th Annual Run 4 the Greenway is a 4 mile and a 1.25 Mile Costume Walk/Run – in honor of UNCG’s 125th Anniversary – will be held Saturday, Oct. 28, 4-8 p.m. at Morehead Park on the Downtown Greenway (475 Spring Garden St beside Morehead Foundry). UNCG is a sponsor in honor of the 125th Anniversary and is providing volunteers for the course monitor positions, water and cheering stations, and other areas. As a volunteer, you get a great t-shirt and a coupon for a free beverage. Click the link below and sign up to help on October 28. Pass this email on to anyone you know that may be willing to give a couple of hours on that Saturday to have fun and support UNCG and benefit the Downtown Greenway. A volunteer training session will be held on Monday, October 9, in the Claxton Room at EUC from 5 to 6 p.m. T-shirts and beverage coupons will be given out. Would you rather walk or run? Go to www.downtowngreenway.org/event/8th-annual-run-4-the-greenway/ to register or for more information about the run. Saturday, Aug. 26, 7:30 p.m.
UNCG Volleyball will host the Spartan-Demon Deacon Classic Friday, Aug. 25 and Saturday, Aug. 26. Saturday night UNCG Volleyball will host Wake Forest at 7:30 p.m., where they will attempt to break the attendance record! The current record is 1,131, which was set in 2010. Bring your family and friends out to Fleming Gym Saturday night! Don’t forget, it’s FREE Admission! Sunday, Aug. 27, 6 p.m.
UNCG Women’s Soccer will host ACC foe Clemson Sunday night, 6 p.m., at the UNCG Soccer Stadium. The game marks the return of legendary men’s soccer alumnus and women’s soccer head coach Eddie Radwanski to Greensboro, who is currently the head coach for Clemson. Radwanski led the Spartans for 10 seasons from 2001-10, amassing a 139-65-13 record and winning the Southern Conference regular season or tournament championship in eight of those 10 campaigns. Gates open at 5 p.m.
Monday, Aug. 28, 7 p.m. Athletics has partnered with UNCG Dining to shut down the Caf on Monday night and set up the ULTIMATE tailgate experience at the UNCG Soccer Stadium. Students will be able to use their meal swipe to enjoy the tailgate, and the general public is also invited to attend. Adults are $9, children (8 – 4 years) are $5 and children 3 years and younger are free. Cash and cards will be accepted (no checks). The menu features marinated grilled chicken breasts, pulled Carolina pork BBQ, vegetable medley, macaroni salad and more! Vegetarian baked pasta will also be available. Tailgate begins at 5 p.m. and kickoff is at 7 p.m. Parking is free in the Walker Avenue Parking Deck during athletic events.